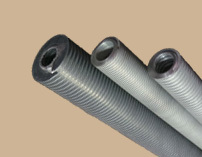 Aluminium fins are formed from a bimetallic tube consisting of a base tube and an aluminium muff tube. 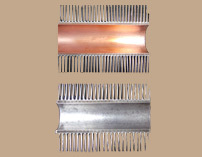 The fins are formed on a cold rolling process from the wall thickness of the aluminium muff tube. 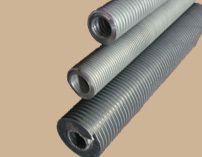 Extruded fin gives very good corrosion protection to the base tube, as the base tube is not visible to the atmosphere inbetween the fins. 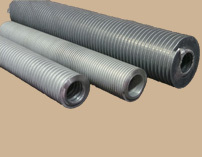 Maximum operating temperature for extruded finned tube is 325 deg C.
Fin OD range : From 38 mm OD to 57 mm OD. Fins per inch : From 5 Nos to 11 Nos. Fin OD range : From 38 mm OD to 82 mm OD. "Any other sizes on request "